Are you seeking gourmet chocolate candy recipes? Making your own gourmet chocolates may seem daunting, but it isn't nearly as difficult as it looks. 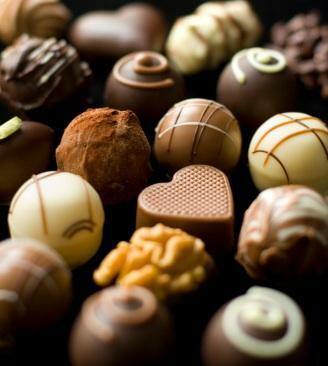 With a few simple secrets, you'll be making your own gourmet chocolates in no time. Gourmet chocolate candy recipes can be found for two types of chocolate candies that you can make in your home. The first is molded chocolate candies, which are simple candies made with a special kind of melted chocolate that is poured into molds to harden. The second type are truffles, which are made from either plain or flavored ganache and then dipped in a hard chocolate that serves as a shell or rolled in nuts, cocoa powder or powdered sugar. Here are recipes for each type of gourmet chocolate candy. All of the recipes can be customized by using flavor oils, liqueurs or even coffee, or by putting a nut or some other small bite in the middle. Confectionary coating is not really chocolate. It usually contains cocoa liqueur and vegetable oil, which makes it very stable for use in molds. Confectionary coating comes in the traditional chocolate color, but it also comes in a number of bright colors. This type of chocolate is easy to work with in molds because of the stability. The trade off comes in the flavor, which isn't usually as well-balanced and complex as real chocolate. Couverture is real chocolate made with cocoa butter and quality dark or milk chocolate. It is complex and smooth but can be difficult to work with because it requires tempering. Carefully melt the chocolate in a double boiler over medium-low heat, stirring constantly until the chocolate is smooth. Pour the chocolate into the molds using either a squeeze bottle or measuring cup. Use the spatula or pallet knife to scrape the backs of the molds and to even out the edge of the chocolate. Tap the molds on the counter to remove air bubbles. Chill the chocolate in the refrigerator or freezer until the chocolate hardens, and then carefully remove from the molds. Place chocolate chips or chocolate shavings in a heat-proof bowl. In a small saucepan, heat the cream over medium heat until it begins to bubble around the edges. Remove the cream from the heat before it reaches a full boil. Pour the cream over the chocolate and stir it until the chocolate is completely melted and the ganache is smooth. Stir in the butter, vanilla and liquid or flavorings. Let the ganache stand for at least four hours or overnight in the refrigerator. Scoop the ganache into balls. Freeze the balls for about ten minutes. For hand-rolled truffles, roll the truffles in cocoa, chopped nuts or confectioners sugar and place in truffle cups. For hand-dipped truffles, melt the dipping chocolate over a double boiler and then carefully dip the ganache balls into the chocolate and place in truffle cups. Refrigerate immediately. Making gourmet chocolates isn't as difficult as it seems. With a little time and patience, you can make delicious custom-flavored gourmet chocolates like a pro.